Hybrid here means cables with different connector types on each end. 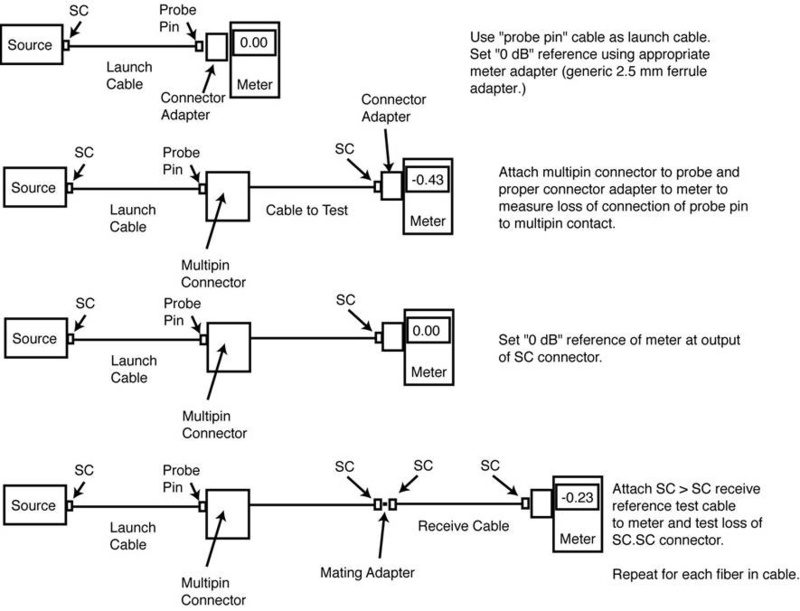 As described elsewhere on the FOA website, there are three ways of setting a reference and testing fiber optic cables depending on the standards requirements or the types of connectors on the cables. However, what happens when the cable is a "hybrid" with one type of connector on one end and another type on the other? And what happens if you need to test each end individually? Here is a solution. Consider a hybrid military cable assembly with a multipin 38999 connector on one end and SCs on the other. The manufacturer provides a SC to "probe pin" cable with a mating pin as a reference cable. Here a picture is worth at least a thousand words. The trick involved is to use two tests, one for each end of the cable, resetting the "0 dB reference" for each test. You need a meter or OLTS with adapters on the detector unless, as in this case, the pin is a 2.5 mm ferrule just like the SC, so a universal adapter will work.